Rabbit recombinant monoclonal Fibronectin antibody [F1]. Validated in WB, IHC, Flow Cyt, ICC/IF and tested in Human. Cited in 30 publication(s). Independently reviewed in 5 review(s). Recombinant full length protein corresponding to Fibronectin aa 1-2400. WB: Human serum and plasma. 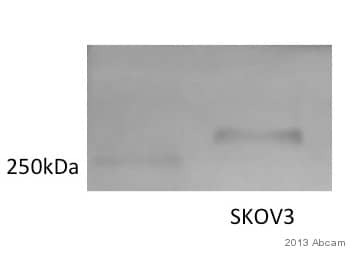 SK-OV-3 and HepG2 cell lysate. IHC-P: Human breast carcinoma tissue. ICC/IF: HepG2 and human mesenchymal stem cells. Flow Cytometry: HepG2 cells. Our Abpromise guarantee covers the use of ab32419 in the following tested applications. WB 1/1000. Predicted molecular weight: 263 kDa. Immunohistochemical staining of paraffin embedded human breast carcinoma with purified ab32419 at a dilution of 1/250. The secondary antibody used is ab97051, a HRP-conjugated goat anti-rabbit IgG (H+L), at a dilution of 1/500. The sample is counter-stained with hematoxylin. Antigen retrieval was perfomed using Tris-EDTA buffer, pH 9.0. PBS was used instead of the primary antibody as the negative control, and is shown in the inset. ICC/IF image of unpurified ab32419 stained HepG2 (Human liver hepatocellular carcinoma cell line) cells. The cells were fixed in 4% formaldehyde (10 minutes) and then incubated in 1%BSA / 10% normal goat serum / 0.3M glycine in 0.1% PBS-Tween for 1 hour to permeabilize the cells and block non-specific protein-protein interactions. The cells were then incubated with the antibody ab32419 at 1/100 dilution overnight at +4°C. The secondary antibody (green) was DyLight® 488 goat anti- rabbit (ab96899) IgG (H+L) used at a 1/1000 dilution for 1 hour. Alexa Fluor® 594 WGA was used to label plasma membranes (red) at a 1/200 dilution for 1 hour. DAPI was used to stain the cell nuclei (blue) at a concentration of 1.43 µM. Immunocytochemistry/ Immunofluorescence - Anti-Fibronectin antibody [F1] (ab32419)This image is courtesy of an anonymous abreview. ICC/IF image of unpurified ab32419 stained human mesenchymal stem cells. The cells were fixed in paraformaldehyde and then incubated in 0.1%BSA / 1% goat serum for 30 minutes, to block non-specific protein-protein interactions. The cells were then incubated with the antibody (ab32419, 1/100 dilution) for 2 hours at 22°C. 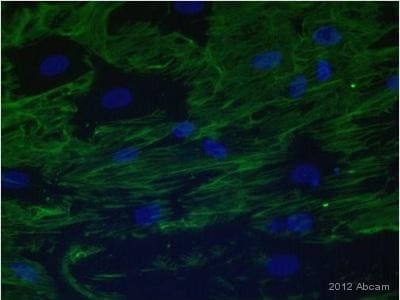 The secondary antibody (green) was Alexa Fluor® 488 goat anti-rabbit IgG. DAPI was used to stain the cell nuclei (blue). Flow Cytometry analysis of HepG2 (Human liver hepatocellular carcinoma cell line) cells labeling Fibronectin with purified ab32419 at 1/20 dilution (10 µg/mL) (red). Cells were fixed with 4% paraformaldehyde and permeabilized with 90% methanol. A Goat anti rabbit IgG (Alexa Fluor®488) at 1/2000 dilution was used as the secondary antibody. Rabbit monoclonal IgG (Black) was used as the isotype control, cells without incubation with primary antibody and secondary antibody (Blue) was used as the unlabeled control. Publishing research using ab32419? Please let us know so that we can cite the reference in this datasheet. we are looking into buying two antibody against human fibronectin and elastin for paraffin blocks (IHC). We need both antibodies to not react against rat or bovine fibronectin or elastin. Fibronectin is a highly conserved protein and the full human protein shares 93% homology with cow and 91% homology with rat therefore there is a large chance that an anti-human antibody will also cross react with cow and rat. In addition, there is no stretch of amino acids in the human protein which is very different from the cow and rat sequences so I think it will be extremely hard to find an antibody specific to human only and for this reason, we do not carry such an antibody in our catalogue. Although elastin is less conserved between species, all of our anti-elastin antibodies tested in IHC have either been tested in rat and/or cow and have been shown to cross-react or have simply not been tested so we cannot guarantee the cross-reactivity. Unfortunately, for the antibodies which haven't been tested in cow or rat, we have not determined the epitope and so cannot perform sequence alignments to predict whether the antibody is likely to recognise cow and rat and so I am unable to suggest an antibody which may be suitable for your needs. Sehr geehrte Damen und Herren, als Verwenderin Ihres Antikörpers C5b-9(ab 55811) bin ich auf der Suche nach einem Fibronectin Antikörper zur Detektion von Infarkten in humanem Myocard in der IHC auf Paraffinschnitten. Bitte empfehlen Sie mir geeignete Antikörper aus Ihrer Produktpalette mit den entsprechenden Preisen, gerne per Email an o.g. Adresse oder auch per Fax zur Weiterleitung an mich.
Click here (or use the following: https://www.abcam.com/index.html?datasheet=32419). Click here (or use the following: https://www.abcam.com/index.html?datasheet=6328). ab6328 ist sehr gut etabliert, und demonstrierte gute Färbung im Infarkt, allerdings im Kaninchen. Desweiteren finden sich gute Kundenrezessionen und viele Publikationen für diesen Antikörper. Bei ab32419 handelt es sich um einen monoklonalen Antikörper aus dem Kaninchen. Diese Antikörper zeichnen sich durch eine sehr Gosse und spezifische Zielprotein- Affinität aus. Desweiteren zeigt gute Färbung und ist die günstigere Alternative. Does this antibody recognize fibronection form A or B? Thank you for your enquiry. If you refer to form A or B as to alternative splice variants known as ED-A and ED-B (ED stands for extra domain), these alternative splice forms are expressed in a cell-type specific manner. We used plasma fibronectin, which is made in the liver, as an immunogen. Plasma fibronectin does not contain ED-A or ED-B; these extra domains are only found in so-called "cellular fibronectin" which is present in tissues. Therefore, it is very unlikely that our antibodies would distinguish between the different variants. I hope this information helps, please do not hesitate to contact us if you need any more advice or information.